I spent the entire day today running a meeting from 8 AM and then writing up the minutes after 5 PM, so this is a "just a photo" day. 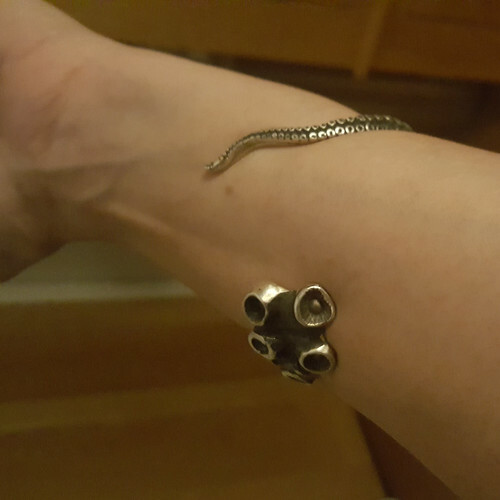 Continuing in the theme of "Cool things people have brought me from their trips to Madrid*", I present the Tentacle Bracelet. It is heavy, silver, and disturbingly comfortable. Ia, ia, etc. * Is the universe trying to tell me something?? This entry was originally posted at https://nanila.dreamwidth.org/1203579.html. The titration count is at .0 pKa. This is a really cool bracelet! Oh - I love the bracelet. Pretty. It's kinda wrong but right that my brain immediately went "if that had features on the back to leave 'sucker marks' after wearing it that would be SO COOL"
That bracelet is lovely and it grips your arm so snugly.